CENTRAL ISLIP, N.Y. – October 22, 2015 - CVD Equipment Corporation (NASDAQ: CVV) has recently deployed a new web presence at: http://www.cvdequipment.com, http://www.firstnano.com, and http://stainlessdesign.com. The websites are designed to be mobile device compatible and functional with the latest and most popular web browsers. The Company believes that you will find its new web design to be user friendly, informative, and provide an intuitive navigation experience to convey CVD’s core competencies and product offerings. 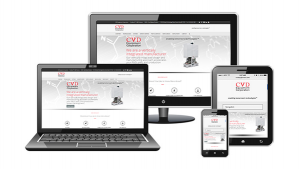 The new CVD Equipment and FirstNano® websites have been launched and are ready to browse, while the new SDC™ website will be launched over the coming weeks. The Company has also revised everything from correspondence letterhead to marketing product brochures to reflect an up-to-date and more accurate image of the Company, the markets we serve and to better communicate our portfolio of products and services. Leonard Rosenbaum, President and Chief Executive Officer stated: “CVD has revised its websites and product literature to generate additional interest for our products and capabilities to enhance our future growth. CVD will routinely revise our website content going forward to ensure that customers continue to look to CVD first for their chemical vapor deposition requirements. The Private Securities Litigation Reform Act of 1995 provides a "safe harbor" for forward-looking statements. Certain information included in this announcement (as well as information included in oral statements or other written statements made or to be made by CVD Equipment Corporation) contains statements that are forward-looking. All statements other than statements of historical fact are hereby identified as "forward-looking statements, "as such term is defined in Section 27A of the Securities Exchange Act of 1933, as amended, and Section 21E of the Securities Exchange Act of 1934, as amended. Such forward looking information involves a number of known and unknown risk and uncertainties that could cause actual results to differ materially from those discussed or anticipated by management. Potential risks and uncertainties include, among other factors, conditions, success of CVD Equipment Corporation's growth and sales strategies, the possibility of customer changes in delivery schedules, cancellation of orders, potential delays in product shipments, delays in obtaining inventory parts from suppliers and failure to satisfy customer acceptance requirements.